The Russian men’s volleyball Major League A, the second tier of Russian volleyball, will expand to 14 teams, and a full relegation tournament will be replaced with a head-too-head relegation for the SuperLeague in 2018-2019. The moves are among a series of changes announced by the league, along with its new league calendar. Previously, the top team from Major League A (tier 2) promoted automatically, while the bottom 6 teams in the SuperLeague played an elaborate tournament, with the bottom 3 of that tournament playing with the 2nd-place team from Major League A for 2 spots in the SuperLeague. Now, the teams that finish the regular season in places 9-14 will play two additional matches against each other, and the team that finishes those extra two rounds in 14th place will be relegated automatically, while the 13th place team will play a best-of-5 series against the runner-up from Major League A for a spot in the SuperLeague. Last year, the club Ugra-Samoltlor was demoted from the SuperLeague as a result of the playoff. The format of the Russian Championship tournament has been unchanged. The quarterfinal and semi-final rounds will remain best-of-3, while the final will be best-of-5. 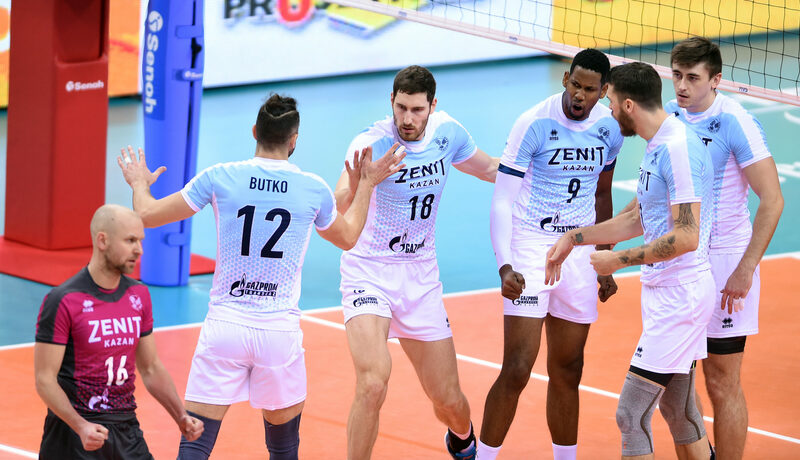 Last year, Zenit Kazan won over Zenit St. Petersburg, while Dynamo Moscow finished 3rd. Major League “A” side Transgaz-Stavropol will move from Koslovodsk to Georgiyevsk, about 100km away. Both countries are located in the Stavropol district in far southwest Russia, with Koslovodsk being home to about 50,000 more citizens. Georgieyevsk is considedred a major industrial center in the region, and is growing in its importance. The 1st stage of the Russia Cup will be held from September 17th-23rd, while the 2nd round will be held from October 1st-7th. Note that the opening round takes place during the FIVB World Championships, where many internationals will be away competing for their national teams. The Russian Championship season will begin on the weekend on October 13th and 14th and extend until Sunday March 23rd. The Russian Championships will be held on April 6th, 14th, and 17th (quarterfinals); 21st, 25th, and 28th (semi-finals), and the final will be May 2-3, May 7th-8th, and May 12th (see the full schedule here). Circle November 18th on your calendars; that’s when Zenit Kazan and Zenit St. Petersburg will play their first championship rematch from last season, in round 5 of the regular season. The replay in St. Petersburg will be on January 23rd. Zenit Kazan, Zenit St. Petersburg, and Dynamo Moscow will represent Russia in the Champions League. Kemerovo will represent Russia in the EKB cup, while Belgorie will play in the Challenge Cup.